Sorry about the link, I don't know how to embed a video. The ponies seem to know that its valentines day, ha ha. Its a bit of a soap opera though. Samson is flexing his pouch to impress Delilah who feels like she is too young to be making fry. (They are about 15 years old in human years). Samson's antics do not however go unnoticed and Eve, the cougar ( who is about 60 years old in human years) is quick to respond. That is apparently not quite what Samson had in mind and he basically tells her to get lost. They can be so dramatic! I've kept yellowhead jawfish and also dusky jawfish in the past. Even though the dusky is much less colorful, it's much better at building, maintaining, and staying in its burrow, and has a ton of personality. They have a large mouth though, so small shrimp might be a snack for them. But then again, maybe that is true for adult yellowheads as well, I'm not sure. 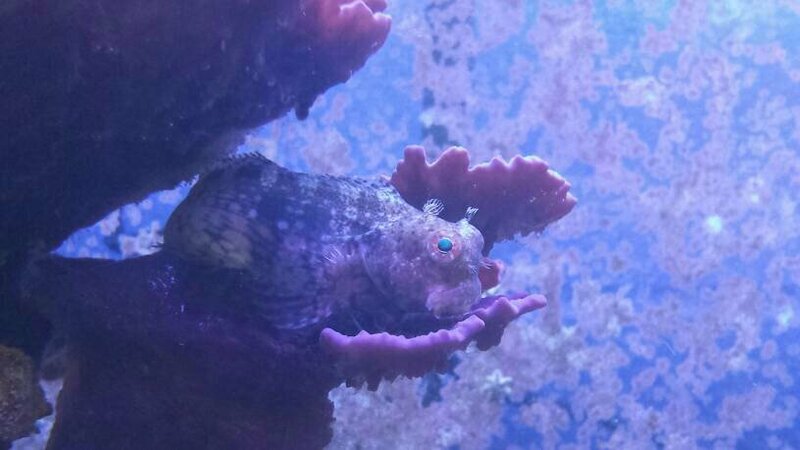 Also, my dusky lived for many years and I had a much tougher time keeping yellowheads alive (in addition to them always trying to leap out of the tank, even through the smallest of holes). Perhaps a good compromise would be the blue spotted jawfish. Also, regarding your sandbed, if you decide to keep jawfish, then you'll need to add a bunch of coral rubble, shells and such so they can build their burrows, and maybe also mix in some larger grain sand and gravel. I enjoyed your vid! The soap opera element is so fun. This is why I like to keep multiples of each species. Their natural interactions are entertainment gold! Your tank looks great too! Lots of fun colors and textures. I love the aqua scape! Thank you for all the info Chasmodes. I would prefer a sturdier jawfish so I will definitely remember the other options. Also considering that jawfish like rubble and larger grain sand maybe they are better procured after I am done with ponies. I will probably start with some small gobies, blennies and cardinal fish while I still have ponies. Ha ha, nothing like a love triangle to add excitement to a tank, (as long as there is no blood!). Thanks Michael. I like the colors and textures too. Last night I was looking at GCE and dreaming. 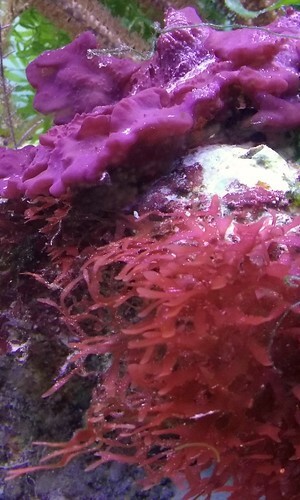 They had sargassum available which I would really like to have along with more sponges and a ricordia pack. 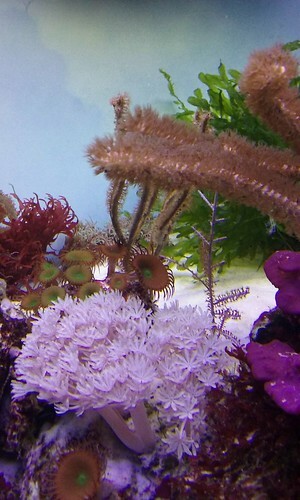 I especially like how you have corals mixed in with your plants. Since they already look like plants, it works! I've been looking at that sargassum too. With the redo coming up, I'm waiting. I absolutely love your tank. I am not familiar with the Red Titan. You mentioned it growing fast. Can you post some close up picture of Red Titan? How does it attach? Again I apologise for taking so long to get this close up of what I call red titan, but here it is. I use a galaxy phone so this is as good a pic as I can get. 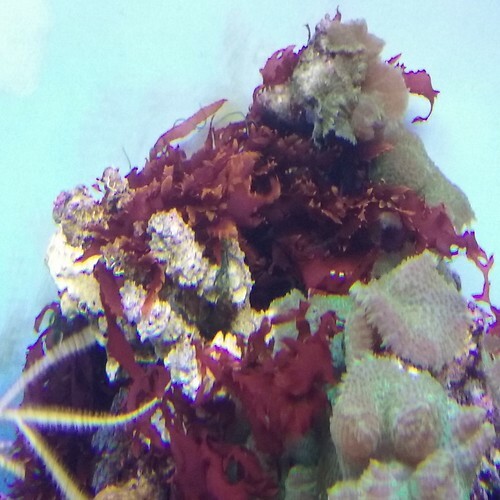 Did you mention if Red Titan attached to rock or substrate. I do recal you saying that it grew very fast. Is it slippery to the touch like Halymenia? I have not been able to post pictures to this site, but I will link you to what I have. It is a very fast grower, does not attach and is very slippery to the touch. I do not feel the picture is representative of what is sold. The Dragon’s Tongue I received from two separate sources in Florida is more open with the foliage showing the alternating colors of red that make it so attractive. I don’t know why that picture was selected, to me it is unattractive compared to what I grew out. Dawn, your red titan looks a lot like grasilaria hayi to me. Also it looks great. That purple thing is a photosynthetic sponge? I though it was mushrooms! That's gorgeous! Now I'm jealous! I've kept a blue photosynthetic sponge before and loved it. Love the garden pic too! Your combinations are inspiring. The red titan attaches to everything, rock included. Not necessarily where you want it to however. Right now there is a piece attached to the overflow, and pieces attached to the clamp that holds the tunze powerhead. Ha ha, there is even red titan growing on one of my trocus snails. It is easily enough removed, not that it will stay gone! I have never seen it attached to the substrate however. O wow Patrick, that is nothing like what I call dragon's breath but then maybe dragon's tongue and dragon's breath are 2 different algaes. My dragon's breath also does not attach, is red with orange tips where the light is strongest and is not slippery. This is what my dragon's breath looks like. I will have to compare my red titan with grasilaria hayi. Whatever it is, I like the way it grows horizonally. Yep, its a photosynthetic sponge. It is gorgeous and its easy to grow too. I love it. My pics always look best when I can concentrate on only a portion of the tank. That way I can look for colors and textures that contrasts and compliment each other. I appreciate the encouragement because I consider myself really poor at the photography end of things. Dave, my hubby took me to a nice lfs for my birthday. I was pleased that they had lots of captive bred fish. Its a risk adding fish to a seahorse tank but captive bred are less risky since they are more disease free. I came home with 2 mandarin gobies (male and female I hope), a yellow watchman goby and a pajama cardinalfish. And I asked them for some of their green grape caulerpa. I have lots of macros but did not have that one. The fish are in QT now and will be for at least a week. I will take pics when they relax a bit. I love that photosynthetic sponge too! It grows in a shape form like Monti Cap, but faster. The fish seemed really stressed in the QT. I decided against my better judgement to add them to the establish seahorse display. All 4 immediately relaxed. The mandys are inseparable and hunting together. The yellow watchman is eating frozen mysis well and I have not seen the pajama cardinal eat yet but it looks really healthy. I am going to do extra WCs to offset not QT the new fish. I like the plating formation that the sponge grows. Everything you described about Dragons Breath was spot on until you said not slippery. There are three species of Halymenia common to Florida, two are called Dragons Breath. I have found both to be delicate and did not have good results. Russ Kronwetter referred to the Pacific variety, as Dragons Tongue. For certain, it is more durable for mounting. I think that Russ Kronwetter was incorrect in his naming Dragons Tongue, After some research and two other separate sources confirming the scientific name Halymenia dilatata. Also, with respect to the picture posted on Live Aquaria / ORA, one that I received did look like the picture. After less than 6 weeks in my systems, it opened up, instead of burgundy (indicating low light) it turned red with orange tips the way we like. Now that I am thinking of it, maybe my dragon's breath is slippery. I was thinking slippery as in rubbery or slimy and it is neither of those. It is difficult to keep it wrapped around anything because it is sort of 'slippery'. Per Russ Kronwetter, Dragons Breath should feel, somewhat spongy. With respect to Gracilaria Hayi, the blades should be flat and somewhat brittle with calcium. I am not sure Patrick, bouncy spongy? It is kind of like that. What I was calling red titan is definitely flat blades and stiff-ish. I agree, I think it is gracilaria hayi. I bought 4 new captive bred fish for this tank, a pair of mandarin gobies, a yellow watchman goby and a pajama cardinal. They are all calm, quiet fish so as to not stress the seahorses. They are captive bred so as to not bring pathogens from the ocean since my seahorses would not have any immune resistance to that. All the fish settled in well. Originally I had them in a 10 gallon QT but they seemed very stressed. Probably too many fish in a small area. I moved them into the display and immediately they looked more relaxed. The watchman ate his first feeding. He has a white place on his back that looks very suspicious. I am keeping the water extra clean. The pajama took about 2-3 days to eat but now is eating like a champ. The mandys began hunting right away. I would really like to get them on frozen food but that will rquire a lot of patience since I can't just be dumping frozen food in the seahorse tank. I ordered 3 bottles of live tisbe pods, 1 for the sump and 2 for the display. Also I am hatching bbs for them. I love the look of the xenia along with the macros. Even though some people consider xenia a bit of a pest species, I find them quite beautiful. I don't remember what forum I saw a post in someones tank, where they complained about them taking over the tank, and I thought, "Wow, that really looks like a beautiful tank!" I guess that I'm a bit weird in that way. Good luck with the newbie fish! I love xenia too. One man's junk is another man's treasure, sort of? Well sadly the watchman goby did not make it. It had a white place on its back and even though it was eating really well, this morning it was dead. It was against my better judgement to buy it but we travelled quite a distance to get to that lfs. Everybody else looks good but I am worried about the mandys getting enough to eat. I love how xenia pulses and moves in the current. How often do you have to prune it? Do you have a good resident population of pods? You may want to supplement with monthly additions, for your mandarins (and horses). How does everyone get along? I bet it's very entertaining with all the new guys.